Our new publication Libya: A Short Guide to the Conflict, written by Sari Arraf, provides an overview of the current situation in Libya and key developments in 2017. This short publication describes the many sources of the instability in the country from 2014 until today and provides an overview of the role and involvement of the various armed groups, as well as a mapping of foreign involvement in the Libyan conflict. 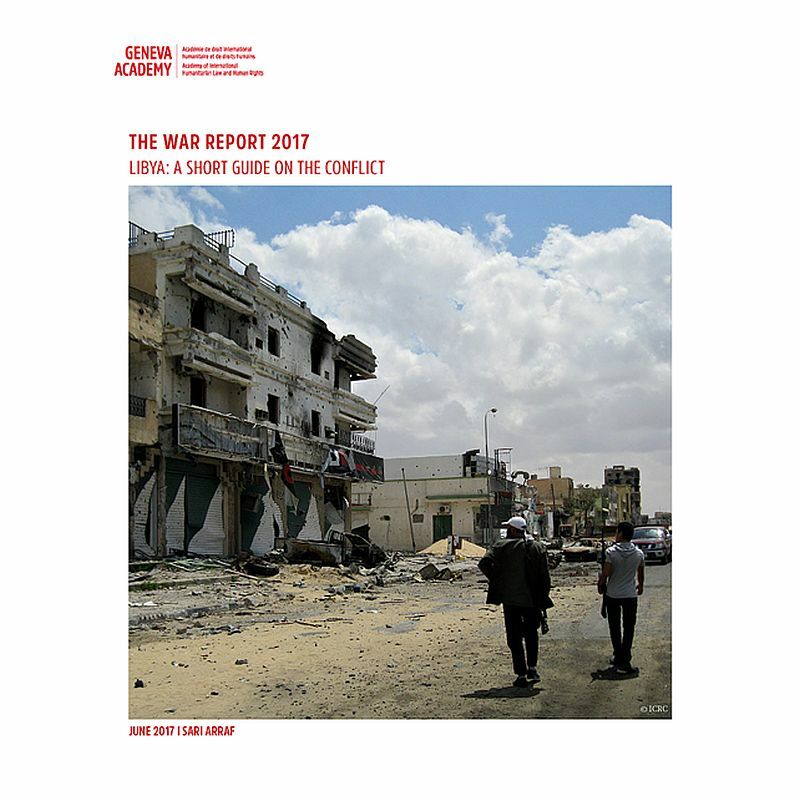 * It will form part, along with other analysis of conflict situations, of the War Report 2017 which will be published at the beginning of 2018. ‘The current situation in Libya is of a high complexity, with more than 15 armed groups involved in the conflict, along with six countries: Egypt, the United Arab Emirates, France, Qatar, Turkey and the United States’ underlines Dr Annyssa Bellal, Strategic Adviser on International Humanitarian Law at the Geneva Academy and Editor of the War Report. The ongoing conflict in Libya is characterized by a myriad of armed groups and actors who are divided across different ideological, national, regional, ethnic and tribal lines. ‘The tendency to depict the conflict as a rivalry between nationalist and Islamist camps suffers from oversimplification, because it tends to detract attention from other factors that come into play’ stresses Sari Arraf, author of the publication. These factors include regional tensions between the historical provinces of the country; tribal and ethnic tensions, which in some cases date back to discriminatory policies pursued in the era of the Gaddafi regime, in addition to conflicts between revolutionary forces and actors identified with the older regime. Moreover, armed groups are strongly embedded in their local context, which means that ideological and political agendas intersect with local identities as well. With growing competition over resources in the country, these conflicting allegiances and identities have further intensified with armed groups vying for a stake in Libya’s future. The current proliferation of armed groups in Libya is anchored in the settings of the 2011 uprisal, which led to the ouster of the Gaddafi regime later that year. The violent crackdown of the former regime on protestors led to the emergence of various local councils and armed militia groups on a city-by-city basis. The situation of violence deteriorated in mid-2014, when Ahmed Maiteeq, widely perceived as backed by Misrata-based Islamist groups, was appointed as the new Prime Minister. On 16 May 2014, General Khalifa Haftar launched Operation Dignity with the purpose of eradicating Islamist militias in Benghazi. Later in the year, a coalition of Islamist/Misratan militias emerged, set to take control of the capital. On 13 July 2014, they launched Operation Libya Dawn in order to drive out Haftar-aligned Zintani militias from their positions in the capital, including the strategic Tripoli International Airport, which had been under the control of the al-Qa’qa and Sawa’iq Zintani militias since the fall of the former regime in 2011. In mid-March 2015, the Islamic State in Libya (ISIL) went on to seize the coastal town of Sirte. The group had first emerged in Libya in early October 2014, when Islamist factions in the eastern city of Derna pledged allegiance to the Islamic State. On 5 December 2016, Sirte was liberated from ISIL after a six-month military campaign led by armed groups loyal to the Government of National Accord (GNA). The operation, called al-Bunyan al-Marsous (‘Solid Foundation’), was supported by airstrikes by the US Air Force at the request of the GNA. Sirte was the last significant urban centre under ISIL control in Libya, and by the end of 2016, the group’s presence was reduced to desert areas in the south and some cells around the country. The number of deaths resulting from the Sirte campaign was reported to be 720, approaching half the death toll in Libya for the year 2016. The year of 2015 was marked by UN-brokered negotiations to reach a power-sharing deal between the conflicting parties. Negotiators included representatives of the two rival parliaments, the Tobruk-based House of Representatives and Tripoli-based General National Council, joined later by independent participants. The negotiations eventually led to the adoption of the UN-brokered Libyan Political Agreement on 17 December 2015. The agreement established the Presidency Council of the Council of Ministers, known as the Presidential Council, which functions as a head of state and Supreme Commander of the Libyan Army. On 23 December 2015, the UN Security Council adopted Resolution 2259, welcoming the formation of the PC and calling upon states to cease support for and official contact with parallel institutions that claim to be the legitimate authority but are outside of the Agreement. The Rule of Law in Armed Conflicts (RULAC) online portal provides information on the classification of the armed conflicts that have been taking place in Libya since 2014, identifies the parties to these conflicts, and the applicable law. *Foreign involvement does not necessarilly means that these countries are parties to the conflict from a legal perspective.